International Conference on Business Ethics and Corporate Social Responsibilities ( ICBECSR-09) has been organized by KLS’s Institute of Management Education and Research, Belgaum, on 3rd , 4th and 5th December,2009. The Conference has focused on the main theme of “Business Ethics and Corporate Social Responsibilities”. Business Ethics and Corporate Social Responsibility have become critical business issues in the scenario of the recent global economic meltdown. The main theme of the ICBE CSR-09 will be to relook at the role of Business Ethics and Corporate Social Responsibility in the changing economic scenario. 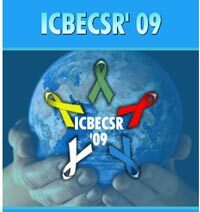 Accordingly ICBE CSR-09 seeks participation from interested practitioners, academicians and students of management and policy makers from all over the world to contribute empirical and theoretical research papers including case studies on topics associated with the overall conference theme. All papers will be subject to a blind peer review and the papers that are accepted will be published. The copyright of the published papers will vest with the conference organizers. 1 Dr. G J Deon Rossouw , Program Executive: Business Ethics, Globalethicsnet, Switzerland. 3. Mr. Sharu Rangnekar, Mumbai. IMER is an Institute with a difference, where an equal emphasis is laid on developing in our students various technical abilities, soft skills along with management competencies.